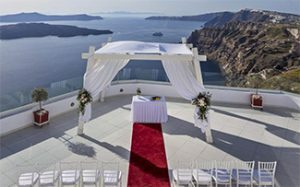 All inclusive Santorini wedding packages info for Santo winery ceremony and resection at Pyrgos restaurant wedding ceremony at Saint Irini chapel wedding venue and Pyrgos restaurant for reception. 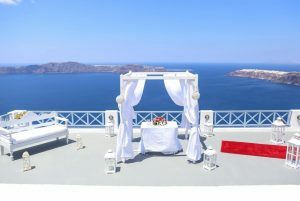 We also include Santorini sunset terrace wedding ceremony information and water front reception ! ♦ Wedding ceremony at St Irene chapel ! ♦ Wedding ceremony at Santo winery ! ♦ Wedding ceremony and reception at Sunset Beach Bar ! At Santorini Wedding Planner we are very proud to organised more weddings than any other company in Santorini. Let our experiments help you to plan your dream Santorini wedding and you could be exchanging your vows by a traditional blue and white chapel on the edge of the caldera, in one of the famous Santorini wineries, in a privately hired beach bar or in a chic boutique hotel. Weddings on Santorini’s unique black volcanic sand beaches are also possible. Wedding receptions in Santorini can take place in a choice of restaurants offering the best Santorinian food, the wineries or you may choose to combine your wedding and reception in one of Santorini’s designer hotels. A la carte and buffet menus are available. The island of Santorini has followed a remarkable journey through thousands of years, surfacing during volcanic eruptions from the earth’s core. A trip to the nearby islets of Palea and Nea Kameni will take you to the heart of the volcano. Following the 1640BC eruption, the first civilisation settlement in Akrotiri was covered in volcanic ash and modern day excavations have brought to light a very important archaeological site with magnificent murals. The amphitheatre, colonnades and some 3000-year-old graffiti at the site of Ancient Thira are also worth a visit. The Byzantine period settlers constructed the wonderful churches of Episkopi and Agia Irini (Santa Irene), whereas the French rule left behind the fortifications of Kastelia and Goulades towers. Due to its fertile soil, Santorini produces high quality wine, cherry tomatoes and fava (yellow split peas). Santonini’s cultural heritage is further enriched by the famous cave houses (yposkafa) and captain’s houses (kapetanospita) that can be found in Fira and Oia.